Form 607 is a Michigan Department of Treasury form also known as the "Report Of Assessment Roll Changes And Classification". The latest edition of the form was released in January 1, 2018 and is available for digital filing. Download an up-to-date fillable Form 607 in PDF-format down below or look it up on the Michigan Department of Treasury Forms website. adjournment of the Board of Review - Administrative Rule 209.26(6b). REPORT ONLY ASSESSED VALUES ON THIS FORM. I hereby certify that all the information contained within this document is true and accurate to the best of my knowledge, information and belief. E-mail the completed form with the assessor of record signature to Equalization@michigan.gov. found by County Equalization, the errors are to be corrected and a revised copy is to be immediately submitted to the State Tax Commission. the revised copy is reviewed and approved by County Equalization, the revised copy must be immediately submitted to the State Tax Commission. Public Act 381 of 1978 prescribes six real property and five personal property classifications. Developmental (D.). These Real Property classes are equalized separately. (Util. P.). All classes of Personal Property are equalized together as one class. assessed value for each class of property. All entries are to be the assessed values as approved by the Board of Review. 1. 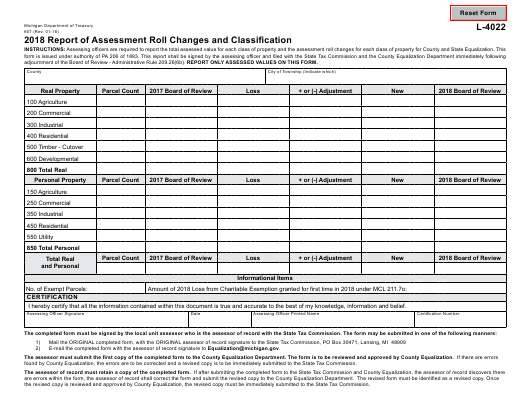 Description on roll for first time or returned from exempt status. 2. Building or other improvement put on description. 3. New additions and improvements. report on Form 603 (L-4018R). the ad valorem roll at 50% of true cash value, but the ADDITION may be less than 50%. 1. Description removed from roll (annexation). 2. Building or other improvements destroyed or removed or exempt. 3. Part of a building removed or destroyed (Note: Tax Day is December 31). 4. Losses from change of description (such as in item 5 under NEW). 5. Land reverted to state or otherwise exempt. 1. Individual assessments raised or lowered to establish uniformity and meet the 50 percent requirement. 3. Change in law, reducing exemptions (Inventory, termination of Public Act 198 of 1974 certificate, etc.). 1. Removal from roll (Out of business, etc.). 2. Fire losses or other damage. (Note: Tax Day is December 31). 3. Decrease in true cash value of equipment, pipelines, furnishings, equipment, etc. 4. Change in law, increasing exemptions (Inventory, air, water or PA 198 of 1974 certificate, etc.). ADJUSTMENTS — Individual assessments raised or lowered to establish uniformity. 607 (L-4022) MUST BE CERTIFIED BY THE ASSESSOR OF RECORD BY SIGNING THE COMPLETED REPORT. UNSIGNED FORMS WILL BE RETURNED TO THE ASSESSOR.